Put your little pinky in the air while lifting your temporary porcelain cup filled with coffee from the table. Be polite, say cheers and take a delightful sip and show your host how delicious this precious moment in time is. After all it’s not every day that you are invited to eat cakes and drinking coffee with Lady MeMe. 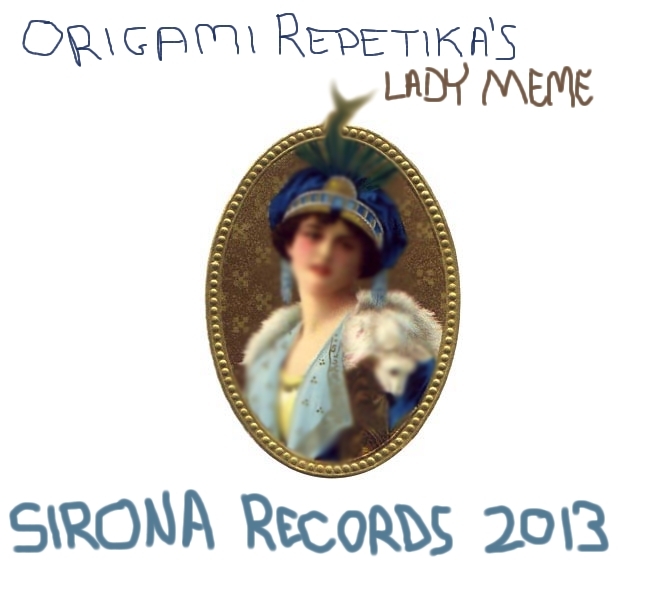 Music-wise the session created by Origami Repetika really sounds as sophisticated and lady like as you might imagine how it would be, brunching away with the delicate high socialite persona that is Lady MeMe. It’s like being comfortable in your cleanest and neatest Sunday costume and really enjoying the good lady-like atmosphere. Absorbing the comfortable zone of a table setup with delicatessen while the pretty and bright hostess entertains you with her story’s of herself and her well respected lady behaviors. Please Let Me Interject’ is the moment to show your gentle politeness to your lovely host. Carefully offer her a mint, an imported bonbon from a far travelled place or perhaps be so kind to ejaculate some fresh cream upon the cakes or in the petite coffee cup. Offer up a Cuban cigar if it seems fit and proper to you in the social circumstances. Whatever you do, be polite, don’t offend but only compliment the fabulous Lady with your presence. And if for any reason you might slip up and do the wrong thing, do not panic as the feel good manners of the music by Origami Repetika will cover you up in a blanket of joyful light weight delight. With the last chapter of such a high society experience it is mostly the hardest not to reveal the actual rat like scum that is behind the Sunday costume and polite behavior. You can just hear the sexual tensions, the secretive long loving love affair that is brewing from when the coffee and cake session had started some while ago. You have to keep it together, just breathe in and out and keep the ungentle perversions locked in your mind. After all you do not want to ruin the sophisticated brunch with Lady MeMe who you secretly adore and want to decorate with French kisses and compliments. Keep your head focused in the knowledge that ‘YouYou Lady’ is such a track that has captured the internal deeper lust and frustration that comes with brunching with a real lady. It just stays with coffee and cakes and utter politeness, but the music will tell you that there is a certain longing from the guest side of the story. You don’t need to change into your Sunday clothes, but it might be nice add to the listening experience. Whatever you do, know that Lady MeMe is waiting for you at the link below to show off her porcelain and lady-like behavior. This entry was posted in ambient, electronic, lobit and tagged ambient, electronica, lobit. Bookmark the permalink.